Japan loves it's festivals. It has festivals for everything. From the traditional such as the Kawagoe festival (which I attended last year) and the Oeshiki festival (which I also went to last year) to the not so traditional such as the Nikufes (which, of course, I went to also!). Well, last month Shimokitazawa held their annual curry festival (official website can be found here, the 4th edition) which went for 10 days. Now the Japanese also love their curry and rice and this year over 150 restaurants, bars and cafes were taking part in this week-long celebration of spice. Now this festival is a little different to your usual festival. It is not held in one location, but you get your hands on a map which has details of each of the participating venues and details of their special curry dishes that they will be serving (from what I understand it cannot be a dish that they regularly serve) and make your way to your chosen curry haven and go curry crazy! I decided that I would write about it and thought that I would need a decent pool of dishes to write about so decided to get through 1 curry per day. Now this is not recommended for you all as by the end of the 10 days, my bed smelled of curry and my students stopped taking my lessons as I became a living, breathing steaming walking pot of curry with it seeping out of my pores. Now I am a single man, but if I wasn't, I am sure that I would have been by the end of the 10 days. So, again, don't try this at home! I must apologise here as some of the photos are not the clearest, but the lighting in some places was not the best for taking photos and I only use a mobile phone (at this stage) to take my photos. 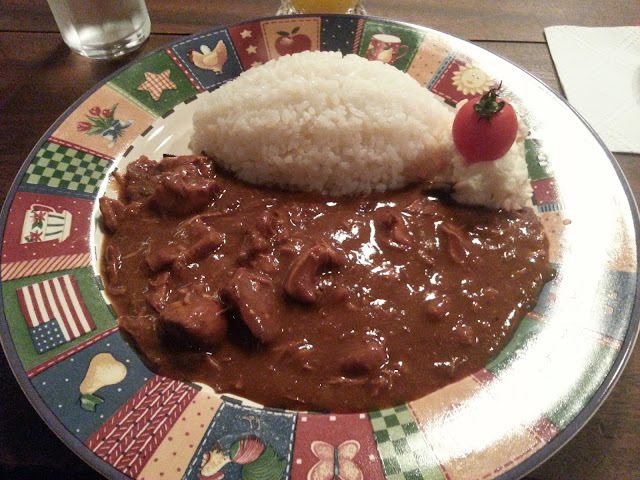 Curry number 1 was a chicken nanban curry from Bar Loaded. For those of you who don't know what chicken nanban is, it is fried chicken dipped in vinegar and covered with tartar sauce, a Fukuoka speciality. Now it is not the healthiest thing to eat, but man, does it taste good! This curry is cooked for 6 hours so the curry has a beautiful rich flavour (the curry has chicken as the base). 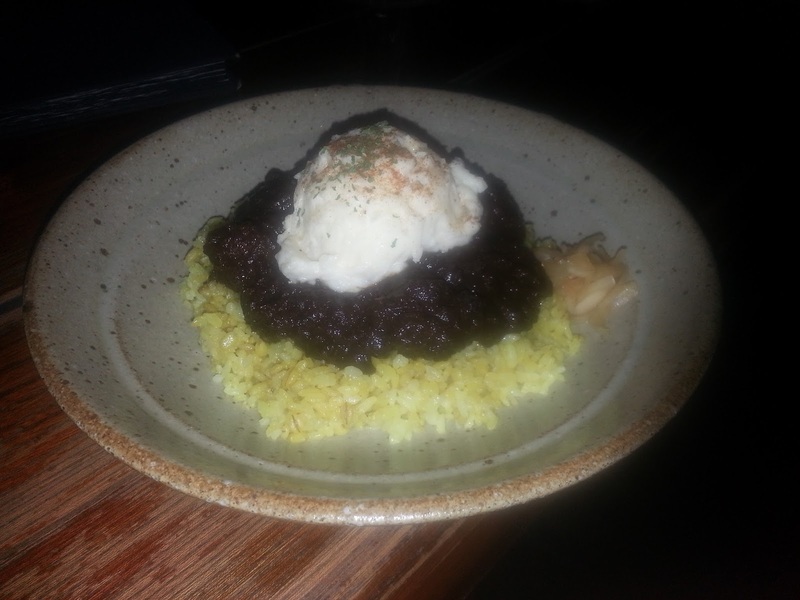 The richness and saltiness of the curry provided a very nice contrast with the freshness of the tar tar sauce! A good way to start curry fes! Next up was an offering from Publion. This one was a nice beef curry. The beef used was beef tendon which tasted like it had been slow cooked as it was nice and tender. The curry base was a tomato base and with beautifully flavoured with spices. I enjoyed the occasional explosion of flavour as I bit down on the occasional whole cumin seed. The next curry was from a little cafe called 46ma shiro kuma. Now the information on this curry stated that it was a 2-time winner of the Shimokitazawa curry of the year award so i had high expectations going here. But I left disappointed. The overwhelming flavour of this curry was tomato. Way too much tomato. The flavour of the spices were not strong enough and there were 2 small pieces of chicken under all of that tomato curry. 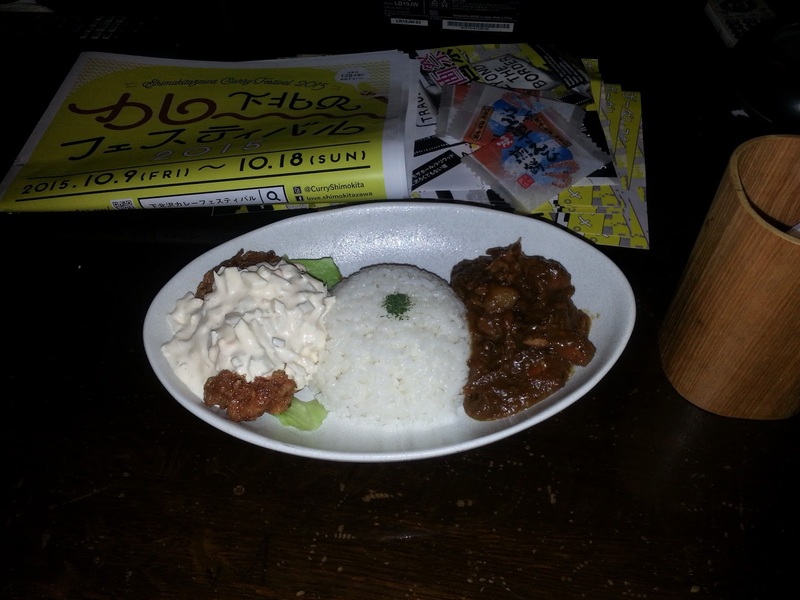 I was determined not to be put off and selected a lamb curry from the craft beer bar Ushitora as my next one. I love lamb, so this one didn't need too much thought! 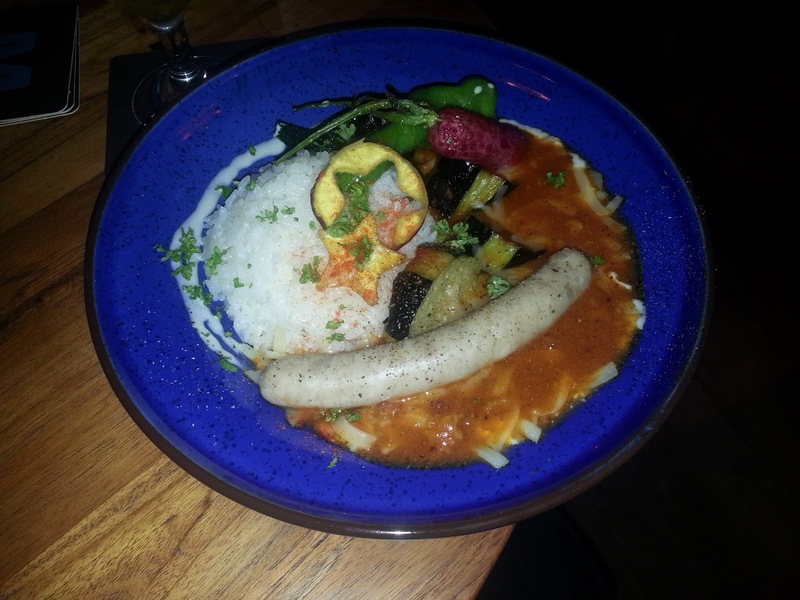 Now the description of this one said that it was "simmered in a generous amount of craft beer". I was worried that it would have too much of a beer taste and would overpower the richness of the curry and lamb. I needn't have worried though as the flavour was all richness. 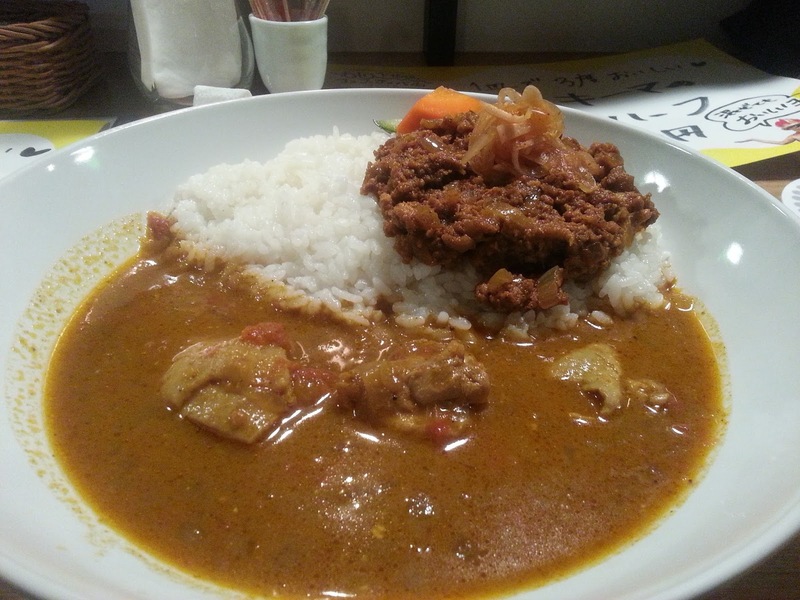 It was a nice thick curry that had a real home-cooked feel and taste to it. After the disappointment of 46ma shiro kuma, this had got me back on track and motivated again! It was going to be difficult for whoever had to follow this one. Old rock bar Back Page (which also has a lot of antique American vintage goods) were chosen as the next selection (it was pretty difficult choosing from over 150 options!). Theirs was described as a "Nostalgic Hakata chicken curry, just like the old days". Now, I had nothing to use as a measuring stick as I had never tried a traditional Hakata chicken curry, so I was going in with a blank canvas. It was rich, a standard Japanese style curry, but a little too salty for me. If you like your salt, and lots of it, then this one is for you. My next choice was one of the non-standard curry offerings. 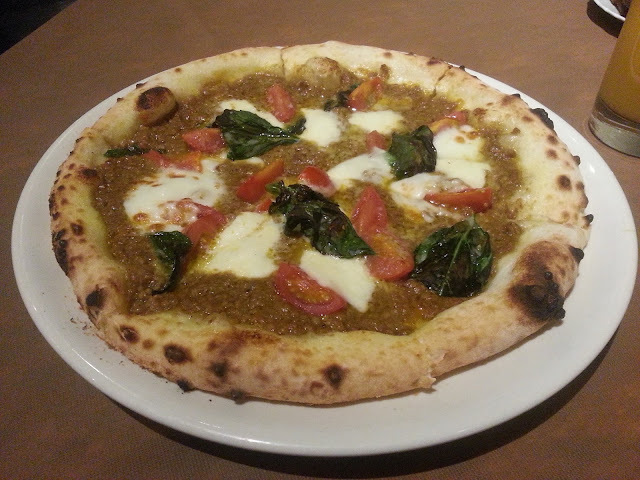 Ms Claudia is an Italian restaurant in Shimokitazawa and they had chosen to do a keema curry margherita pizza. Sure, I was up for the challenge! I selected a curry from Matsu to Eda, a new little cafe on the north side as the next dish. Their speciality for the festival was a medley of chicken curry and keema curry. The chicken curry had a sweet honey flavour to it, and some nice heat. The keema was a dry curry that also had chickpeas in it. This was another good one. Not bad, a little plain, but definitely not the worst I had tried. I was now 8 down and 2 to go and surprisingly I had not gotten tired of eating curry. I guess you can put that down to the fact that there was so much variety on offer. The next one was another of the non-standard offerings. This time I made my way to a nice little bar / cafe called &ROLL. Their dish was a Thai yellow curry risotto! The first mouthful of this one was a revelation! 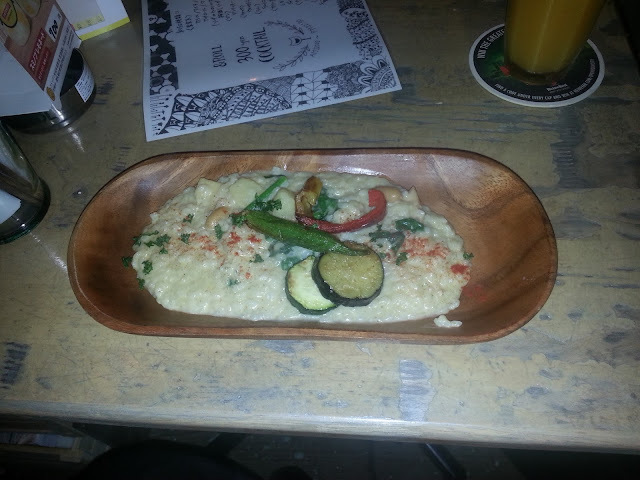 The mild Thai curry flavour was perfectly matched with the cheesy risotto. Superb! I was disappointed when I finished as I knew I would now have to wait another year to try this again! The 10th and final curry was one that I had been eying off for a while. 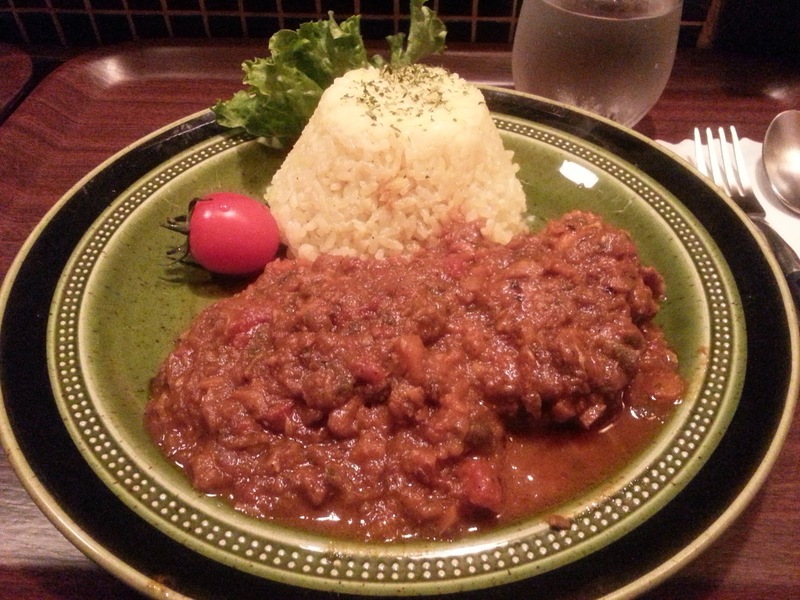 It was a curry from LanCul which is an English conversation cafe / bar. 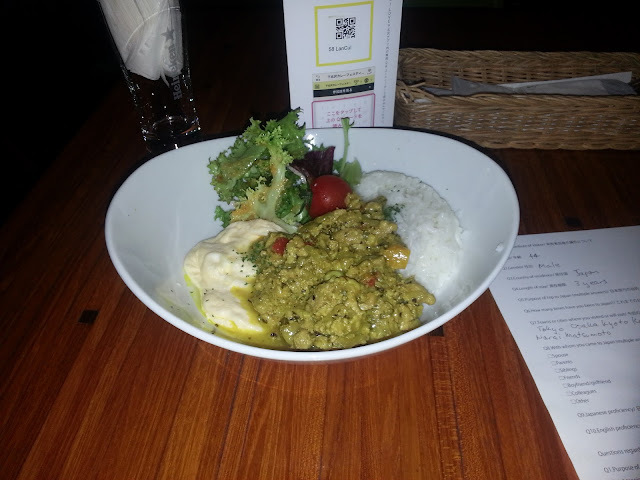 Their offering was a vegetable coconut keema curry. Now this was a light, mild curry, one might say it was a curry perfect for a lady! It was nice, but I prefer my curries full, bold and rich. Having said that, it was a nice way to finish curry fes. So, what curry was the winner in my eyes? Well I couldn't separate 2 of them. The 2 best curries, in my eyes (and tastebuds) were the chicken nanban curry from Bar Loaded and the Thai yellow curry risotto from &ROLL. They were the 2 standouts! I had made it through 10 curries in 10 days and now it was time for my body to recover! So, if you live in Tokyo or are going to be in Tokyo in the month of October, get along to Shimokitazawa and get your curry on! Thanks for reading. Please leave a comment below and sign up with your email address to the right side of the page or bookmark and come back and visit again! See you next time! I love curries very much so I was really enjoying to read this interesting post. Thank you for sharing and nice descriptions! In my case so far I prefer Nepalese ones with hot naan, especially butter chicken curry with mango lassi, or other spicy thick ones include Japanese. You know I live in Yokohama and rarely go to Shimokita. Therefore I have never heard the curry event in Shimokita. But it's definitely fun! You say it's annual event so I'll check the update and go there next year! In addition to your best 2 curries, I'm also curious the lamb curry. To be honest I have never tried. I'd like to try them and maybe plan to go to Pannya, too. thanks for leaving another comment! I heard that there used to be a curry museum in Yokohama. I was very excited when I heard about it, but disappointed when I found out it was closed! Lamb is my favourite meat, so that was a very nice one for me too. I agree with you too, a good butter chicken is a very nice curry. In fact, the best butter chicken I ever had was in Phuket in Yhailand! It really surprised me!! Anyway, I hope you enjoyed your curry today! I enjoyed reading this very much. Outside Japan people are not familiar with the fact that there is curry in Japan and a very very good one for that matter. Not to be compared to the liked of India, Bangladesh, Nepal, etc, or even the ones in England, as Japanese curries are their own species but yummy indeed. Keep making the best out of your stay in Japan. Thanks for sharing this. it's good to hear from you. 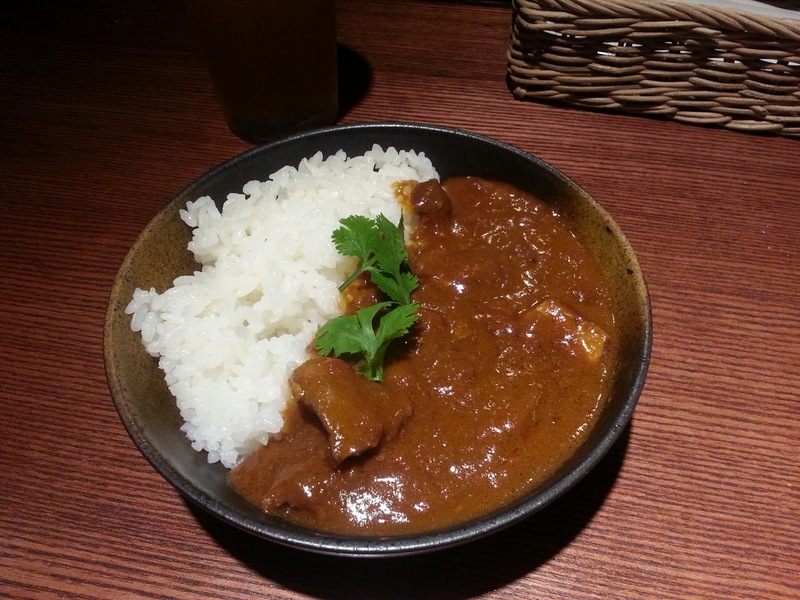 I remember sharing a couple of curries with you at lunch in Akasaka Mitsuke. You are a curry aficionado, so thanks for stopping by! You are right, if a person expects something similar to a bangladeshi or Indian curry when they try a Japanese curry, they will be surprised, but a good Japanese curry is a beautiful thing! No doubt Jason you are curried....what a task! !I tried 2 curry dishes whilsy in Kyoto and whilst they were ok,for me they did not taste anything the curries I was brought up on.The curries we had back in my youth,tasted better on the secon and third night and the leftovers were spread on toast for breakfast... oishii desu! If you are returning to Adelaide in the foreseeable future,check out Himeji Izakaya,opposite Coles in Grote St.They specialize in Ramen and abowl costs $13.90.The coffee is excellent as well.It has a real Japanese feel about it, with timber bar and booths.They have an extensive menu and brands of Nihon shu and I can almost guarantee, anyone would enjoy the food and atmosphere there.The proprietor is Japanese and runs the Genki Sushi Bars as well. Well Merry Xmas from the land downunder.Will be having some Coffin Bay Oysters for lunch on the 25th,some Wallaroo Blue Swimmers and prawns caught locally.Kanpai and all the best..Noel. you are right, the curries in Japan are different to the ones that we ate during our youth. They have a little more of a sweet taste. It is definitely a comfort food for the Japanese. After 10 in 10 days though, I definitely needed a break from curries. I may be back in Australia in a couple of months time. I will keep you posted. If so, I would love to meet up for a bowl of ramen or something else at Himeji Izakaya! Merry Christmas to you too, and stay safe. I will do my best...ja mata...sounds like a good idea! My favorite food is curry. Out of all curry, I like Butter Chicken Curry the best. I'm very happy that I can take your class!